Lake Como used to be known as Duck Lake, which I contend is a better name. It should have kept it. I had a cousin who once changed her name, and like the Como/Duck fiasco, I liked her first name better as well. In spite of this mix up, Lake Como is a curious thing. On one hand, it’s intensely shallow. On the other hand, it’s uniquely muddy. It’s the third largest lake in Walworth County, but it’s not much to consider. My lack of Lake Como knowledge aside, I gathered the troops, ignored the Highway 67 detour signs, and wrapped my way around to the north shore of Lake Como. Freddie’s West End is a bar here, across the street from that lake, wedged into a residential neighborhood. It is not without charm. When I pulled up, early, at 5:10 pm, the parking lot and adjacent streets were lined with cars of varying makes and models. The rain from the wet week had cleared and the bar was full of patrons ready to kick the weekend off with some libations and fish. Do not go to Freddie’s expecting to find a restaurant. This is a bar, through and through, much like a Northwoods bar, this place has little concern for what you think of it. We walked in what I believe to be the side door, off of a small deck that had a few tables and chairs, still soaked from the rain. When I walked into the South Shore Bar near Delavan Lake, I was quickly judged by the patrons who knew I was out of place. At Freddie’s, there was no such judgement. A friendly fellow at the bar mentioned something about the weather, and I, noticing the ease of his effort, chimed in. I asked the bartender if we might be able to sit outside, and though she’d need to find something to wipe off the wet tables, she obliged. We settled into our chairs with a fine view of Lake Como in the background, and learned of their fish fry. The menu was simple. 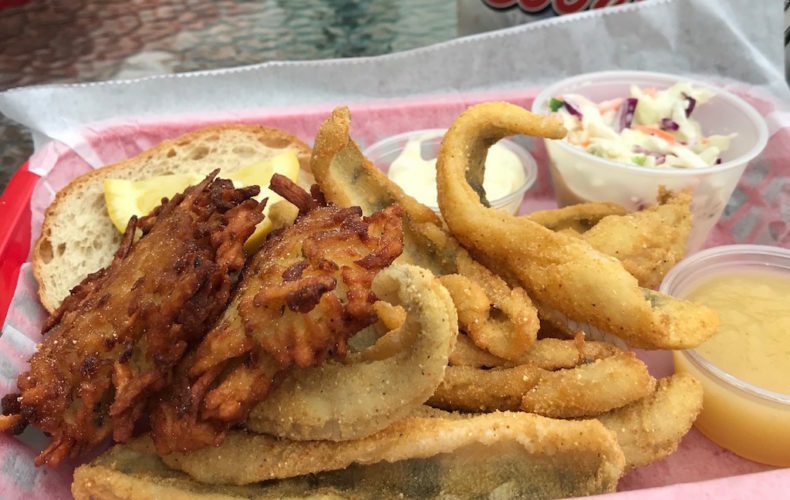 It’s Mary Lynn’s Old Fashioned Fish Fry for $12. If you don’t like it, the only other thing to order would be the chicken tenders for $6, but more on those later. 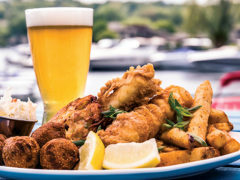 The fish fry comes with the Wisconsin fixin’s, and gives diners the choice of Walleye Pike (a fancy name for Walleye favored by Northwoods types), Lake Perch, Blue Gill, Fried Shrimp, Shrimp DeJonge, or Poor Man’s Lobster (cod). Interesting to note, the only cod option is baked, not fried. If you came to this bar and wished to eat fried cod, you might as well ask for a cobb salad with avocados. You’re going to leave hungry. The waitress was attentive and sweet, and we made our decision. The three of us ordered the Walleye, the Perch, and the Cod. Feeling like the chicken tender must have done something special to wriggle its way into this fishy menu, I added in an order at the last minute. We waited for around 20 minutes for the food to arrive, which I found to be somewhat of a strange delay given the basic nature of the menu. Still, the wait offered a nice chance to inhale some cigarette smoke that was wafting across the patio, and I hadn’t had a smoke in my whole life, so I needed my nicotine fix. The food arrived in plastic baskets, which felt right for this bar. The fried assortment of fish and potato looked the part, and I was excited to taste the variety. The perch filets were numerous, lightly breaded with a cornmeal exterior, and almost crunchy. The very light dusting of cornmeal wasn’t enough to make for a crunchy exterior, but it was enough. The perch was quite good. I had perch at Gordy’s, and this was easily as good or better. The french fries that accompanied that order were crunchy and thick cut, very nicely prepared. French fries shouldn’t be hard, but they are, and Freddie’s has them mastered. 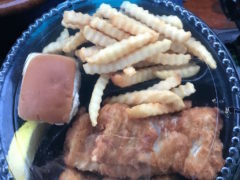 The walleye dinner was one large fried filet, dusted in the same cornmeal as the perch. It was meaty and white, perfectly cooked. Unfortunatley it desperately needed salt, and I had loads of bones in my piece. I have ten intense fears in this life, and one of them is choking on fish bones. I don’t know if I have ever choked on one, but I fear it anyway. In the way that I’ve never been bit by a large spider, but it’s one slot above the fish-bone-choke on my list. I cannot tolerate bones in fish filets, so it was a disappointment. The applesauce was smooth and blah, the tartar sauce and coleslaw both okay but, much like me, did not receive any express praise from my wife. The baked cod was quite good. A touch overcooked, but just barely. The drawn butter was flavorful, as drawn butter must be. I dunked a few pieces and decided it was an above average cod. The potato pancakes, two to an order, were small and dense. Too dense. The interiors were starchy and dry. Last up, these chicken tenders. One bite revealed the truth that the menu was hiding. These were not chicken tenders, these were chicken tender shaped Mcnuggets. The assortment of mashed chicken bits into a tender shape was not good. In fact, it was terrible. I wouldn’t order these bits of chicken again if they were the last chicken Mcnuggets on earth. Even McDonald’s knows there’s a different between a nugget and a tender, and I’d hope Freddie’s fixes this error, soon. All in all, I sort of enjoyed my visit to Freddie’s. It wasn’t great, but it wasn’t awful. 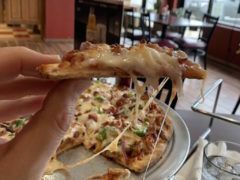 The subtle ambiance of a Northwoods bar is something that slowly grows on you and gains your allegiance, and I can see how Freddie’s has become a local favorite. But judged without prejudice, it was just okay. The perch was the standout I think, though it was admittedly made better by a quick bath in the drawn butter that I borrowed from my wife’s cod. The walleye had too many bones for me, and the potato pancake was below average. I’d add Freddie’s to your rotation if you haven’t ever been, and if you’ve already been, well, then I’m guessing you already knew to avoid the chicken.